Aaron Boone’s career achievement. Photo via youtube.com screenshot. 2nd version of this post: first one was done after the 2014 Hall of Fame class was announced and the voting results made public. On 1/6/15, the BBWAA announced the results of the 2015 Hall of Fame class. 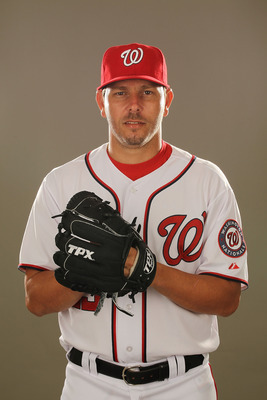 Sadly, we go another year without any player with Nationals ties going into the hall. So, thus far the Nats greatest Hall of Fame achievement is Vinny Castilla receiving 6 sympathy votes. I’m sure this will change when Pudge hits the ballot in a couple years. While researching for the #1 overall pick Starting Pitching matchup post, I found myself typing up little mini biographies on each of the pitchers. I ended up moving that content to a new post, which you see here. This is probably the last draft-related post for a while, until I summarize how our draft picks did at the end of the season. Here’s a biography and career summary of every pitcher who’s been taken #1 overall in the history of the MLB draft, which started in 1965. PeterGammons.com has a review of all #1 picks, which looks like a nicer-formatted version of the b-r.com page. Dave Cameron wrote a WSJ article talking about the fact that just two HS arms have been drafted 1-1 prior to 2014 and they were both failures, and Baseball Prospectus’s Steve Goldman printed his own own version of this same post in 2009 with great insight not otherwise available, but it was light on details for the last 5 or so guys. Believe it or not, there’s only been 17 pitchers picked first overall (including 2014) … and there’s *never* been a prep right handed starter picked. Fourteen of the seventeen first overall pitchers selected came from college, and twelve of those fourteen were right handed pitchers. Here’s a brief history of each #1 overall pitcher. 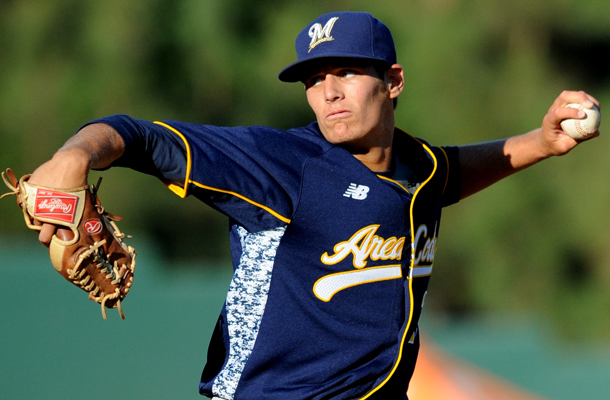 2014: Brady Aiken, LHP from Cathedral Catholic HS in San Diego, drafted 1st overall by the Houston Astros in 2014. Issues with pre-draft consensus 1-1 Carlos Rodon led the Astros to go with just the third prep pitcher ever to go #1 overall. Aiken is considered the best talent in this draft by nearly every pundit, with a live arm, good mechanics, 3 excellent pitches and good command. He quickly signed a below-slot deal, saving the Astros a ton of money that should enable them to sign over-slot deals later on in their draft. There’s plenty of draft coverage of Aiken in the normal places, so we’ll focus on the previous guys who by now have at least a bit of pro experience. 2013: Mark Appel, RHP from Stanford, drafted by the Houston Astros in 2013. Appel had quite a draft day history; he was picked in the 15th round out of HS and didn’t sign. And then in 2012 he was thought to be the #1 draft prospect in the draft (the first year where there were significant restrictions on bonuses by slot) but fell to #8. The Pirates drafted him at #8 but couldn’t put together an over-slot enough deal to convince him to forgo his senior year. So that’s what he did; pitched his senior year and then went #1 overall to Houston, who got him to sign an under-slot deal soon after the draft. Appel was assigned to low-A to finish out the 2013 season and did well, but has struggled mightily in 2014 for Houston’s high-A team. Some say that he has been unable to adjust to Houston’s “tandem” starting scheme, where guys throw fewer innings/pitches per outing but throw more frequently (every 4 days). I agree; I think Houston is really foolish to take a prized possession such as Appel and shoe-horn him into a weird/non traditional rotation experiment. Put him in AA, put him throwing regularly every 5 days and see what he can do. As of this writing, he sports an 11+ era in the California League, having given up 10 runs in one 1 1/3 inning-outing at the end of May. The word on the street was that he was suffering from a hand issue which prevented him from locating (but didn’t sap his velocity); still; that’s an awful lot of hits and runs to give up to A-ball players for a guy who (in some opinions) could be in the majors right now. Is it too early to worry? 2011: Gerrit Cole, RHP from UCLA, drafted by the Pittsburgh Pirates. Cole was part of an amazing 1-2 punch at UCLA in 2011 (his rotation mate was Trevor Bauer, taken 3rd overall in the same draft. Amazingly, UCLA didn’t even advance out of its own regional despite having two top-3 starters in their rotation). Cole didn’t pitch in 2011, but “solved” high-A and AA in his first pro season in 2012 and was called up in mid 2013 once he’d cleared super-2 status by the cost-conscious Pittsburgh Pirates. He was excellent in 2013, maintaining a sub 3.00 FIP for the year and helping Pittsburgh make the post season for the first time in a generation. 2009: Stephen Strasburg, RHP from San Diego State, drafted by Washington. 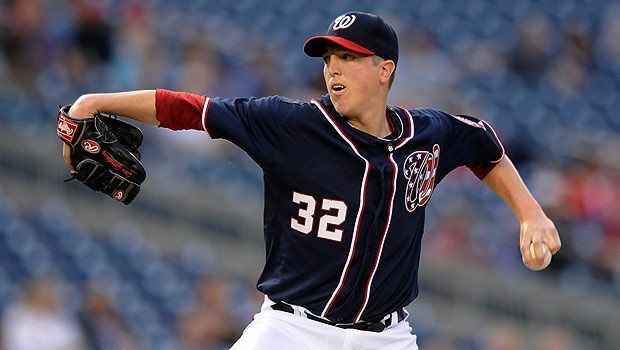 We all are quite familiar with the story by now; Strasburg was a laconic out-of-shape hurler in high school who barely merited a college spot, then re-made himself into the “greatest pitching prospect of all time” while at San Diego State. Despite his reported bonus demands (he ended up with more than $15M deal) and his representation (Scott Boras), the Nats never seriously not selecting him with their first round pick. The team played the “service time” game with him, keeping him in the minors until his super-2 eligibility was exhausted, then he struck out 14 Pirates in his MLB debut. 2007: David Price, LHP from Vanderbilt, drafted by Tampa Bay. Price was the friday starter for Vanderbilt, who entered the 2007 post season as the #1 overall CWS seed but who somehow lost in their regional. Price signed late (this was before the moved-up signing deadline and often big-money draft picks had to wait for the signing deadline to be announced) so he didn’t debut until 2008. He quickly proved to be un-hittable in high-A or AA and was promoted to the big club in September of his first pro season. He was up and down (both to and from Durham and in terms of performance in 2009) before exploding onto the scene in 2010, going 19-6 and finishing 2nd in the Cy Young race to Felix Hernandez. Price won the Cy Young in 2012 in a close race and is generally been considered one of the best 10-15 pitchers in the game. The biggest question with Price now is where he’ll end up; he’s arbitration eligible and earning a significant portion of the Tampa payroll, and his name has been in the trade rumors for two years running. However 2014 may finally be the time Price moves on; Tampa has the worst record in the majors and probably starts making moves as soon as the all-star break passes. I look for Price to join a playoff contender and have a real impact in 2014 and 2015 before his 9-figure payday arrives. 2006: Luke Hochevar, RHP from Tennessee/Indy league, drafted by Kansas City. Hochevar burned quite a few bridges in Los Angeles prior to his joining Kansas City; he was drafted by the Dodgers twice, the second time agreeing to and then reneging on a 1st round deal worth nearly $3M in 2005. Instead he played Indy ball and went 1st overall in 2006 to the Royals, who gave him a (now banned) MLB deal with significantly more money than the Dodgers offered. He debuted in 2007, but generally struggled as a starter for the Royals for the next 5 seasons (compiling a 38-59 record in those years). In 2013 he remade himself as a wipe-out 8th inning guy, posting a 215 ERA+ for the rising royals. Unfortunately, he sucummed to the dreaded Tommy John disease early in 2014 and had surgery on 3/7/14. Hochevar’s injury couldn’t be more badly timed; he’s a free agent this upcoming season and likely will have to sign a non-guaranteed deal until he can show he’s recovered. 2002: Bryan Bullington, RHP from Ball State, drafted by the Pittsburgh Pirates. Bullington’s selection by the penurious Pirates was considered a “signability pick,” with the GM given direction to sign a “safe” college pitcher as opposed to one of the prep talents that were higher ranked on most draft boards. So Pittsburgh selected Bullington (in lieu of B.J. Upton, Prince Fielder or a slew of other now-successful MLBers from the 2002 draft). To be fair, Bullington was considered the #1 college arm in the 2002 draft, but few thought he was the #1 overall talent. He held out for months, finally signing in October of 2002 for $4M. He progressed slwoly through the Pittsburgh system, debuting in September 2005. He was hurt though, got diagnosed with a torn labrum and the Oct 2005 surgery cost him all of 2006. He never was really effective afterwards, sputtering through 2007 and part of 2008. Pittsburgh waived him in 2008. After that he bounced around 3 organizations in the next 3 years, ending up with a callup by Toronto in late 2010 where he threw 8 innings of shut-out ball to earn is sole major league victory. For the last three years he has pitched in the Japanese Nippon league. 1997: Matt Anderson, RHP from Rice, drafted by Detroit. Detroit picked the Rice hurler believing that his position (closer) and his velocity (100mph capabilities) would mean that he was quick to the majors and they were right; after dominating high-A and AA, he was in Detroit’s bullpen by late June 1998. He had a great debut season but mostly struggled with control issues (career 5.5 bb/9) as a 7th/8th inning guy. He tore a muscle in his shoulder in 2002 (allegedly by participating in an Octopus-throwing contest earlier in the day), which sapped him of his velocity upon his return. Detroit sent him to AAA in 2004 and then released him at the end of the season. After 2005, he bounced around 3 different organizations, attempted a comeback in 2011 with the Phillies and now is completely out of baseball. 1994: Paul Wilson, RHP from Florida State, drafted by the New York Mets. Wilson was part of a trio of high-end Mets pitching prospects who were expected to be the next wave of power arms for the team (himself, along side of Jason Isringhausen and Fairfax’s Bill Pulsipher). Wilson’s career peak may have been the year after he was drafted, throwing 180+ innings in the minors. 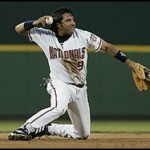 He struggled in 1996 at the major league level and subsequently had to have Labrum surgery. That cost him most of 1997 and 1998 … then to add insult to injury he tore his UCL and had to have Tommy John in 1999. By this point the Mets were apparently tired of waiting for him to develop and traded him to Tampa Bay. There, he finally got back on the field in 2000 and pitched well enough to earn a 4yr deal from Cincinnati. Unfortunately, he tore his rotator cuff, underwent his third surgery as a professional … and never made it back afterwards. He tried to rehab the arm in the minors in 2006, suffered a set-back, took a non-guaranteed deal in 2007, had a set-back, and tried Indy ball in 2008 before being released and retiring. Despite all these injuries he managed to make 150+ major league starts. 1991: Brien Taylor, North Carolina HS, LHP, drafted by the New York Yankees. One of only three high school pitchers ever taken number one overall and (excluding the two most recent draftees) he’s the only player on this list who never appeared in the majors. Taylor was hitting 98-99 as a HS pitcher, had an absolutely astounding 21 K/9 rate (he struck out 213 in just 88 HS innings), and by more than one scout’s opinoin was the greatest high school pitching prospect the game has seen. Unfortunately he suffered a significant shoulder injury (a rotator cuff tear that separated the cuff from the bone) in a bar fight while in the minors, missed an entire season after surgery, and lost 8mph off his fastball. The Yankees released him without his ever appearing above AA. After bounching around odd jobs, he was arrested for cocaine trafficing in 2012 and is currently in federal prison. ESPN has a great oral-history just posted about Taylor, with all sorts of quotes from Yankees officials of the day. He’s a sad story all around. 1989: Ben McDonald, RHP from LSU, drafted by the Baltimore Orioles. He was the consensus #1 overall pick, the best player in the college game the year prior, and had just led USA baseball to the gold medal in the 1988 olympics. He is one of the most “close to the majors” pitchers ever drafted. He signed on August 21st and made his MLB debut just 18 days later, pitching out of the bullpen. In July 1990, he pitched a 4-hit shut-out in his major league debut, a game I distinctly remember watching on TV. McDonald was a phenom and was going to bring Baltimore back to the promised land. It never happened: McDonald struggled with injuries and ended up leaving Baltimore after his initial deal ended. In Milwaukee he was pitching well but suffered a torn rotator cuff, from which he never recovered. McDonald was out of baseball at the age of 29. In the years since, he was elected to the College Baseball Hall of Fame, a nod to his completely dominant career at LSU. 1988: Andy Benes, RHP from Evansville University, drafted by the San Diego Padres. Career 1989-2002. Benes was a “pop up” guy who went from being an unknown prospect to a first rounder thanks to an amazing 21-K outing his junior year in college. 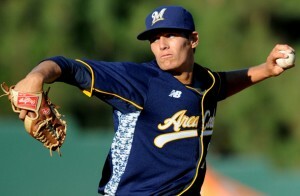 The Padres were “drafting for need” somewhat and had targeted a quick-to-the-majors college arm to be their #1 pick, and Benes was the best available choice. He was a multi-sport player in college, which some pundits believe limited his pitching development. He was known to have an excellent fastball with great command … and little else. Nonetheless, he flashed through the minors and debuted in 1989, finishing 5th in the Rookie of the Year voting. For the next six years he was basically a #3 starter/innings eater for San Diego, never missing a start, putting up great K/9 numbers and compiling a near .500 record for a series of decent-to-awful Padres teams. 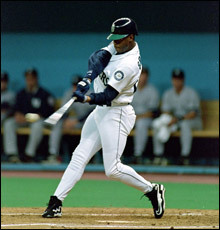 He was traded to Seattle in 1995 (for one Ron Villone) in his walk year to join the Mariners for their playoff run, then signed a 2-year deal with St. Louis. He pitched well in St. Louis, even getting Cy Young votes, but then a contract snafu led him to join Arizona ahead of their debut season, where he threw the first pitch in franchise history. After his stint in Arizona, he came back to St. Louis but a series of injuries cause him to miss significant time during his last two seasons. He pitched excellently in the 2nd half of 2002, but his declining health (he suffered from an arthritic knee, which sapped him of his power, forced him to pitch with a knee brace and caused him to become more of a finesse guy later in his career) caused the Cardinals to decline their 2003 option on Benes. Frustrated with his health and unwilling to pitch anywhere but in St. Louis, Benes retired in the winter of 2002. 1983: Tim Belcher, RHP from Mount Vernon Nazarene College, drafted by the Minnesota Twins. Career 1987-2000. Technically Belcher was a #1 overall pick twice. He was drafted by Minnesota #1 overall but didn’t sign (Minnesota was known to be cheap with their money back then), and then was picked #1 again in the January 1984 supplimental draft phase by the Yankees. Belcher visited two more organizations before making his debut, getting snagged by Oakland from the Yankees as FA compensation, then getting flipped to the Dodgers after Belcher struggled in the minors. He was immediately effective for Los Angeles though, giving them several good seasons after finally debuting at age 25. He threw EIGHT shutouts in 1989 enroute to a 5th place Cy Young finish, his most effective season as a pro. He was flipped to Cincinnati (for Erik Davis) and bounced around 5 other orgnaizations from there, always featuring as a #3-#4 starter quality guy who stayed relatively healthy and ate innings but was nothing more. His career was ended thanks mostly to an elbow surgery late in 1999; he tried to come back in 2000 but was mostly ineffective and hung them up in spring training of 2001. He served as a coach in the Cleveland organization for most of the rest of the decade but (as far as I can tell) has been out of the game since 2011. 1981: Mike Moore, RHP from Oral Roberts, drafted by the Seattle Mariners. Career 1982-1995. Moore was already a known quantity, having been drafted in the 3rd round out of High School. After being drafted by Seattle (who by 1981 also had former #1 overall pick Bannister on their payroll), Moore made just 14 minor league starts before debuting in the majors in April of 1982. Predictably, he got hammered. Seattle was generally awful during Moore’s entire tenure there, despite his putting up several 5-6win seasons. When he made it to free agency, he joined Oakland and immediately became the leader of a world series winning squad. He finished his career off by vastly underperforming during a 3yr/$10M contract with Detroit, ending with his being released a month before his contract ended. He ended up with a career profile quite similar to some of the names above here (especially the likes of Benes and Belcher): decent career, #3 starter ceiling, .500 pitcher. 1976: Floyd Bannister, LHP from Arizona State, drafted by the Houston Astros. Career 1977-1992. As with Moore after him, Bannister was a 3rd round pick out of HS but opted to go to Arizona State, where (like McDonald and Benson after him) he was the collegiate player of the year and the clear #1 overall prospect in the draft. And like several guys before him, he ended up being less of a total Ace and more of a #3/#4 starter, .500 career record kind of hurler. He probably had his best season for the White Sox in 1987, but knocked around three more organizations and Japan after that, retiring in 1992 with 363 career starts. 1973: David Clyde, Texas HS LHP drafted by the Texas Rangers. Career 1973-1979. The first ever pitcher taken #1 overall was Clyde, who turned into a cautionary tale of what NOT to do with your prep draftees: Clyde was a Texas-based high school phenom who had an amazing senior year and was the consensus #1 overall pick. But Texas did something rather extraordinary; they drafted Clyde and then immediately put him on the major league roster. He ended up starting 18 games for Texas as an 18 yr old, mostly as a publicity stunt by the owner, looking for increased box office revenue. He got hurt, was traded to Cleveland and was out of the league by the age of 24. His wikipedia page is a good read; after retiring he went through some tough times but seemed to come out ok.
Best career of any #1 overall pick by total bWAR: Andy Benes with 31.7 bWAR compiled over a 14 year career where he was basically a .500 starter (career record: 155-139, career ERA+ was 104). Belcher didn’t quite have the bWAR but had the longest career of any of these guys. You can probably argue that David Price is more successful already by virtue of his Cy Young award. Least successful #1 overall pick: clearly Brien Taylor, the only one of these 17 players who never reached the majors (excepting recent picks Appel and Aiken of course). A couple of the other picks here at least made the majors but compiled negative bWAR for their brief careers. Hey, how about a Hall of Fame post that doesn’t cause any arguments? So, thus far the Nats greatest Hall of Fame achievement is Vinny Castilla receiving 6 sympathy votes. The next few ballots have more of the same: 2015’s features Ron Villone and Julian Tavarez and 2016’s ballot features Cristian Guzman and Jose Guillen. Not until we hit 2017 do we get our first, legitimate Hall candidate/former National in Ivan Rodriguez … and of course there’s no way he gets elected thanks to his ties to PEDs. But i’m sure it’ll be fun to write this post again next year. Several years ago (November 2010) Mark Zuckerman posted a fascinating analysis he titled “From Nats to Oblivion.” It chronicled the astoundingly high number of players that the early incarnations of the Nats were using who, once the Nats released them, never again appeared on a MLB roster. I thought the analysis was so interesting that I kept up the same data and have been keeping it up-to-date with the whereabouts of Nats-to-Oblivion candidates ever since. So with apologies to Mark for stealing his idea, here’s an interesting visit to the Nats darker past. Now, it is nearly impossible for a team to field an entire year’s worth of players who fall into this “Oblivion” category. Every MLB team has guys playing out the string or near retirement, and every MLB team calls up guys through out the season from the minors who eventually show themselves as unable to compete on the MLB level and who never make it back. Our 2011 team (sitting at 13.6% but likely to eventually be lower) is about as close to a 10% level as we may get; roughly 4 or 5 guys who give you at bats or innings in a given year probably won’t ever play again. For your reminiscing pleasure, here is the summary data updated to the 2012 team. I think its clear that at least a few of these guys are going to re-appear on a MLB roster at some point, so this “candidate ratio” is likely to be lowered. 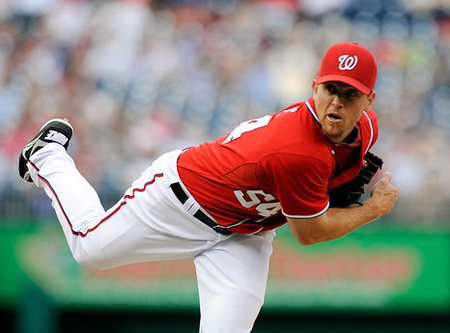 Favorite Nats-to-Oblivion story: Brad Lidge, who gave it one last shot and failed spectacularly. When you lose your stuff, its gone and gone fast. I’ll readily admit I thought the signing was a great one but it just didn’t work out. I really hoped that Lidge would be a servicable 7th inning guy and mentor to Drew Storen and Tyler Clippard, being one of the great closers of his day. It didn’t work out that way. As with the 2012 candidates, I wouldn’t be surprised to see this list get lowered slightly. A couple of these guys remain in the system and Cole Kimball remains on the 40-man. Atahualpa Severino could see time if KC’s loogy situation falls apart. I had to recently remove a couple of names from this list after they re-appeared on 2013 MLB rosters (example: Justin Maxwell who was Houston’s opening day center fielder. That ought to tell you all you need to know about Houston’s team this year). 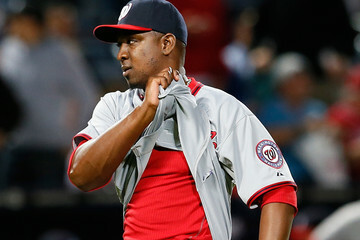 Is Gorzelanny going to be tendered? Find out today. Photo via Nats. The next big date on the MLB offseason calendar happens today, Monday December 12th. This is the “Non-Tender Deadline,” or the last day for teams to tender 2012 contracts to players under reserve. In english, this means that all the Nats arbitration eligible players must be “tendered” a 2012 contract by this date or else they become immediate free agents. Here’s a list of the Nationals that are arbitration eligible this off-season, their 2011 salary and an estimate of what they would cost for 2012 if offered arbitration. Both Tyler Clippard and Jordan Zimmermann achieved “super-2” status, meaning they’ll get a 4th arbitration year down the road. Contrary to other reports, Roger Bernadina did NOT qualify for this super-2 status, despite being right on the borderline of service days. The above salary guesses are partly taken from mlbtraderumors.com analysis and partly adjusted to what I think the player would really earn. Side note on the way to estimate/guess the salaries: For those with three years of arbitration, the salary achieved is usually a representation of an eventual percent of the FA salary would be for the player, based on the arbitration year. These percentages are usually 40% of FA value for the first year of arbitration, 60% for second and 80% for third year. Thus, using John Lannan as an example, his first year Arbitration salary was $2.75M, meaning that his 100% FA salary value would be $6.875M/year. After his good 2011 season though, I’m estimating his 100% value to be $7.5M/year, or exactly what we paid Jason Marquis per year, which puts his 2012 arbitration figure at the $4.5M estimate. So, what should the Nats do with these arbitration cases? To me, five of these seven cases are straight-forward; you absolutely tender Clippard, Flores, Lannan, Morse and Zimmerman. MASN’s Pete Kerzel posted his thoughts on this same topic over the weekend and seemed to indicate there would be a question as to whether we would tender Flores; that’s crazy talk. In a league where quality catchers are a scarcity and with Flores tearing up the Venezeulan Winter League right now, there’s no reason to think the team would possibly lose him. After all, we just put a journeyman AAA catcher Jhonatan Solano on the 40-man specifically to keep HIM from being poached. Also, I hear rumblings that Lannan may be non-tendered under the theory that he’s not providing value worth what he’s going to be paid (roughly $4.8-$4.9M); again I think that’s misguided. He’s a solid pitcher who gives good innings from the left hand side, and he’s only been improving since he earned a spot in the rotation. He’s never missed a start due to injury, and if not for the first half of 2010 (when he lost his way and was demoted) he’d have a sub 4.00 career ERA, a rarity in this league. Replacing him on the open market would absolutely cost more than he’s set to earn next year. Plus, with any decent run support (the Nats averaged only 3.6 runs/game in games when he started in 2011) he’d probably have a much better W/L record. That leaves Gorzelanny and Slaten. Case by case. 2.143 whip. That’s so ridiculously bad as to be almost laughable. He gave up 26 hits and 9 walks in 16 1/3 innings. He had a -0.1 WAR. He had a .356 batting average against. Opposing batters had a 1.036 OPS with him on the hill. He allowed 47% of inherited runners to SCORE. Not advance, but score. 15 of 32 runners. Lastly, in lefty-lefty matchups, the whole reasons he is put into games? 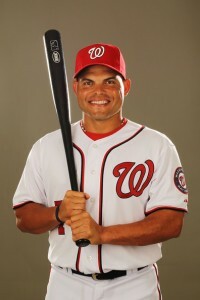 Lefties hit him for this slash line: .333/.368/.639 for nifty 1.007 OPS. He struggled with injury last year, and yes its difficult to determine how much of the above performance was due to the lingering effects of the injury. So be it; this isn’t personal; he was awful in the role and he’s replaceable either from within (Severino, VanAllen or Smoker) or on the FA market (where there’s always an older lefty in the Ron Villone mold looking for work). Verdict: Basically, not only should Slaten not be tendered a contract, he should have been flat out released months ago. 2. Tom Gorzelanny. A tougher call. The Nats traded three prospects just a year ago to acquire him (though, in fairness, none of the three guys we traded have done much to improve their prospect status; AJ Morris didn’t play any 2011 games, Graham Hicks had a 4.01 era in 14 starts while repeating low A-ball for the 3rd time, and Michael Burgess batted .225 after being demoted to high-A. So it seems we basically got Gorzelanny for nearly nothing). 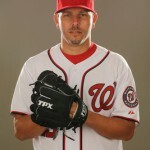 He lost his spot in our starting rotation after 15 starts in 2011, but was excellent in 15 relief appearances. 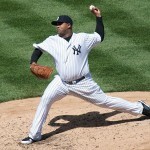 His starter/reliever splits show a 4.46 era in his 15 starts but a 2.42 era in 15 relief appearances. I think Gorzelanny would make an excellent long-man/spot starter out of the bullpen, a role that Davey Johnson values heavily. His flexibility to be anything from a one-out guy to a 6 inning spot starter is indeed invaluable, and his 8.2 k/9 rate from the left hand side shows that he can be a shut down pitcher,when he needs it. So what is the problem? His salary. 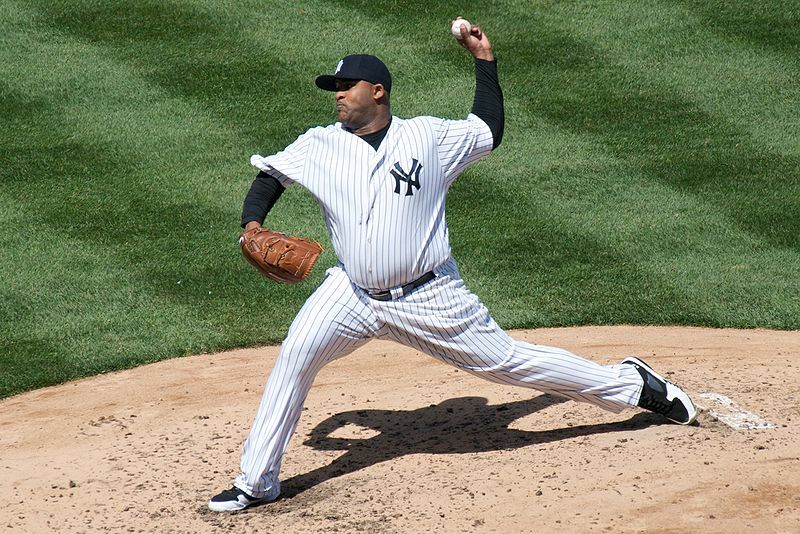 Is he set to make more than a mediocre middle reliever is worth? He made $2.1M this year in his first arbitration year, when his salary and value was being measured as a starter. One would have to think that he’d easily get an increase if the team tendered him (I estimated $2.8M for his 2012 salary if tendered), and it would be difficult to argue against an increase despite his failure as a starter. So the question becomes: is $2.8M too much money for a middle reliever? A quick glance at some of the reliever FA signings thus far gives some comparables : Jeremy Affeldt signed a 1yr/$5M contract and Javier Lopez signed a 2yr/$8.5M. Both these guys are mostly loogies (especially Lopez) but also both had far better numbers than Gorzelanny, even just looking at his reliever splits. Meanwhile a couple of non-closer right-handed middle relievers (Dotel, Frasor) signed deals for between $3.5 and $3.75M/year but aren’t nearly the long-man capable guys that Gorzelanny is. So perhaps a salary in the $2.8M range for Gorzelanny isn’t too bad.